Let me tell you about a fairy tale of two brothers who started off their business with an initial investment of only 4 lakhs , how the angle touched her magic wands to their business and how their companies net worth increased to 9900 crores in just six years. Yes, you are guessing right! It’s about Flipkart .com. Flipkart is an Indian e-commerce company headquartered in Bangalore, Karnataka. It was founded by two brothers Sachin Bansal and Binny Bansal in 2007. In its initial years, Flipkart focused on online sales of books. But it later expanded to electronic goods and a variety of other products. Flipkart offers multiple payment methods like credit card, debit card, net banking, e-gift voucher, and cash on delivery. The cash-on-delivery model adopted by Flipkart has proven to be of Great significance since credit card and net banking penetration is very low in India. From a start-up with an investment of just four lakh rupees Flipkart has grown into a 9900 crores revenue online retail giant in just six years. Getting tie-ups with major book vendors as they did not have an offline book store. Getting approval for the credit card payment gateway. Besides, they did not want to use CC Avenue for its interface seems confusing. As far as getting tie-ups with major book vendors was concerned they somehow managed to persuade them and as on date most of the vendors are supporting them. Since they were a self-funded startup and didn’t have an offline presence, it was really difficult for them to convince but they eventually were successful in convincing Axis bank for payment gateway. Although the journey was quite challenging for them especially in building trust with the customers, suppliers and so on however, they overcame it by persevering in the face of challenges. In the beginning they started by identifying people who could trust them and gradually went on building a good relationship with them, which helped them in getting more customers through word of mouth and viral marketing. Besides, they even made a few assumptions regarding their marketing which when went wrong they had to change their business model accordingly. Everything was not so smooth for them initially. Till now they have changed directions quite a number of times and have taken each mistake as a learning experience. They started out in 2007 by setting up three centers across India without funding and by 2012 they reached number one status. Today, the e-commerce company is four times bigger than its nearest competitive company. The company aims to touch Rs 50 billion turnover by FY 2015 on the back of increased penetration of broadband and the firm’s massive expansion plans. The second leg: In 2010, they added media, mobile phones and accessories to their catalogue. The third Leg: in 2011, product launches included cameras, computers, pens & office supplies, computer accessories, home and kitchen appliances, personal care, health care, gaming consoles, audio players and televisions. Flipkart also launched a new Electronic Wallet feature the same year that allows shoppers to purchase credit to their Flipkart account using credit or debit cards, and can subsequently be utilized to make purchases on the site, as and when required. The fourth leg: In 2012, product launches includes health & beauty products, Life style products which includes watches, belts, bags &luggage. From June 2012, Flipkart allowed people to buy toys, posters and from October 2012, Flipkart entered into apparel retailing. 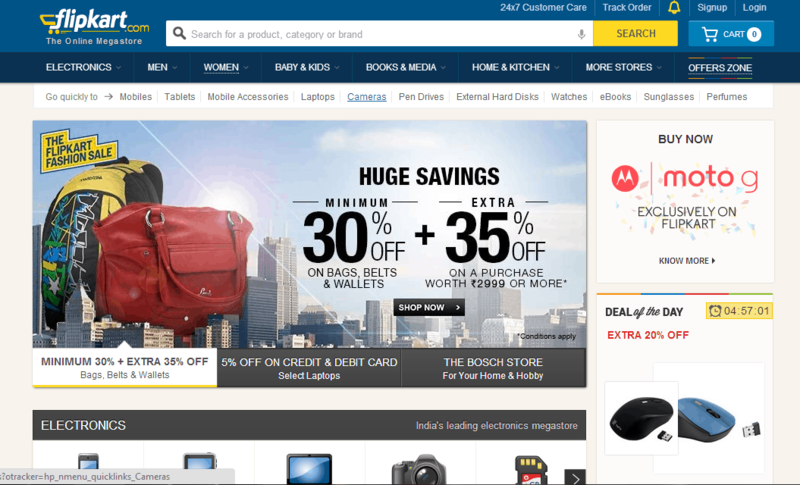 2012-Letsbuy.com is India’s second largest e-retailer in electronics. Flipkart has bought the company for an estimated US$25 million. As Internet usage in the country is increasing and people are getting accustomed to making purchases online, Flipkart projects its sales to reach US$ 1 billion by year 2014 and aims at generating a revenue of 50 billion (US$1 billion) by 2015.